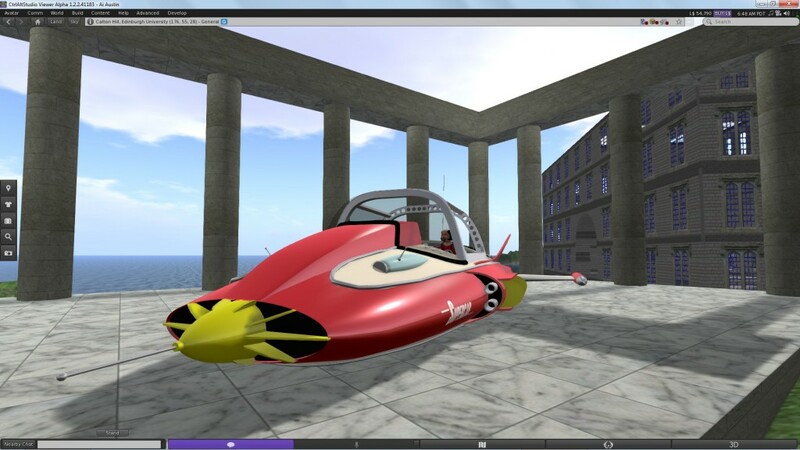 David Rowe (twitter: @CtrlAltDavid) has released an early experimental version of his CtrlAltStudio Viewer for Second Life and OpenSim which can support the Oculus Rift DK2. The viewer already supported 3D stereoscopic displays for the NVidia 3D Vision (with active shutter glasses and a 120Hz+ screen) for example, and gave support for 3D input devices such as the XBox 360 for Windows controller and the Microsoft Kinect. 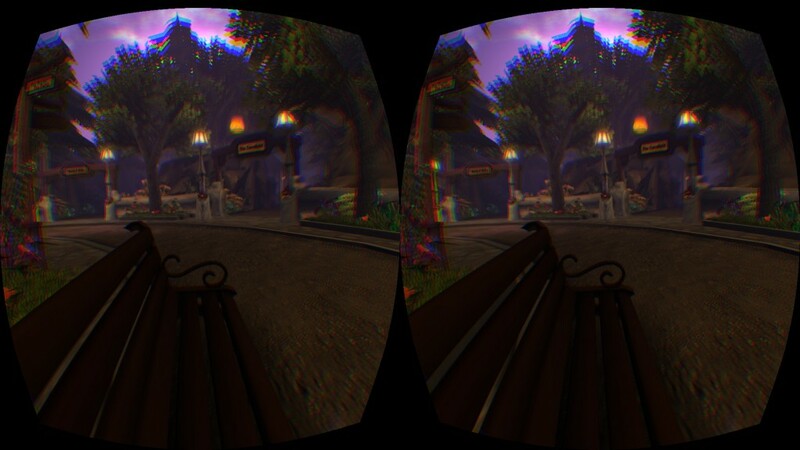 Due to some problems with the current Oculus Rift 0.4.1.SDK and its support for OpenGL as required for the viewer, this initial version does not implement “Direct to Rift” which will be the preferred way to drive the Rift DK2 display in due course. The DK2 is set up as a second “extended desktop” screen and in “Landscape” orientation by a method which can vary between different version of Windows and depending on whether you use the Windows “screen resolution” method or your GPU’s control panel. 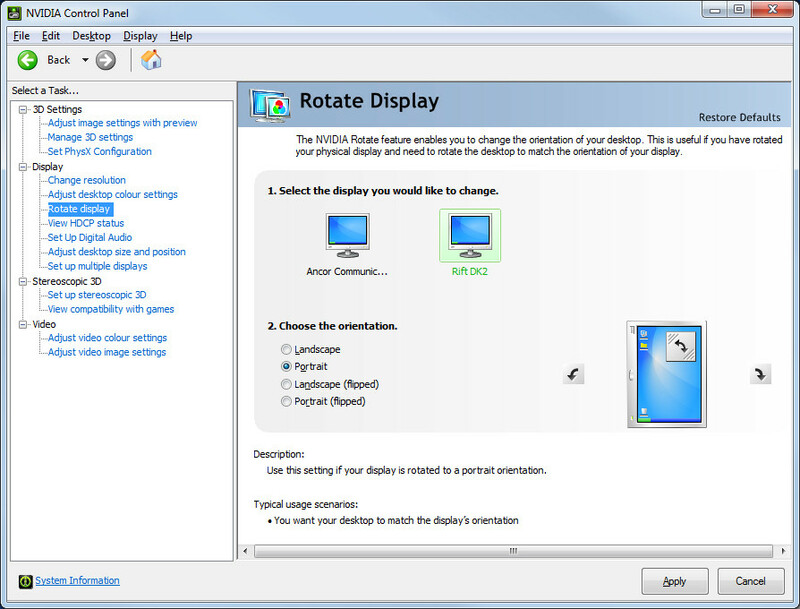 See the section later for more details related to the Rift display rotation (“Portrait” versus “Landscape”) and refresh rate (75Hz preferred). The viewer must be configured to be in windowed mode (opposite to that required for the 3D stereoscopic mode), i.e., make sure Preferences -> Graphics -> General -> Fullscreen mode is not ticked. 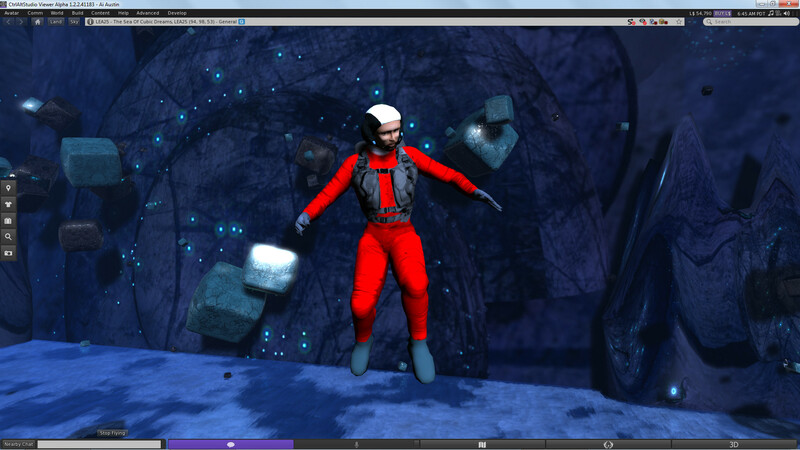 And the Advanced Lighting Model must be turned on via Preferences -> Graphics -> General -> Advanced Lighting Model. The viewer is started and then the Windows key + right-arrow (twice) is used to move the viewer window onto the Rift’s display, then Ctrl+Alt+3 makes the window full screen and switches into Rift view. Ctrl-Alt+3 again to turn off 3D and full screen mode and then the Windows key + left arrow moves the display back onto the normal screen. 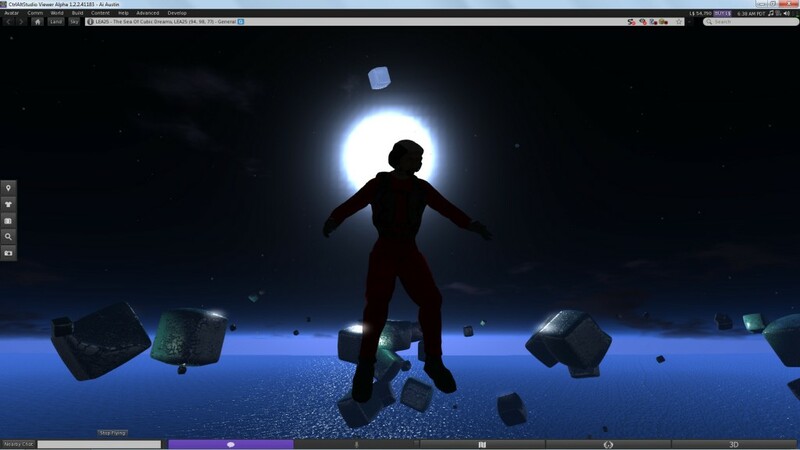 So, no need to be “Alone in VR Space” any longer…. 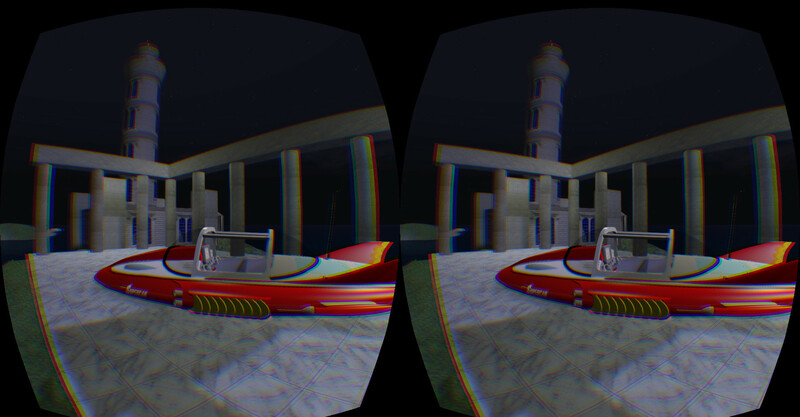 see this blog post on early (solo) demo experiences with the Oculus Rift DK2. 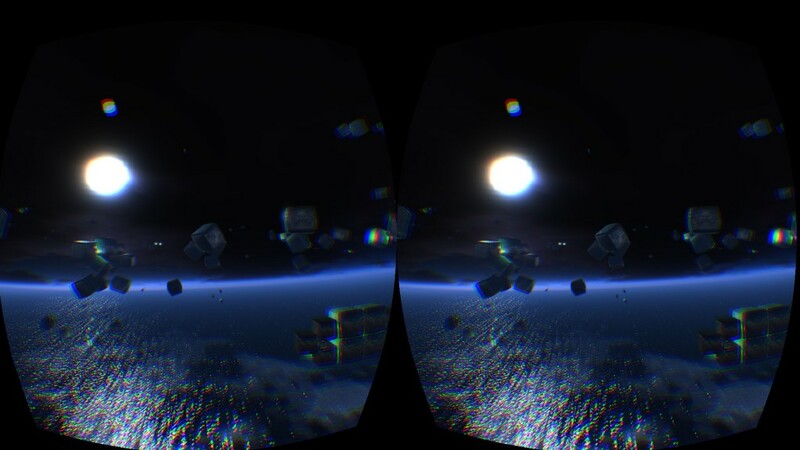 The CtrlAltStudio read me and Rift set up notes say to use “Landscape” mode for the Rift. But the method to achieve the correct orientation can vary. I found that in the Windows “screen resolution” control panel, the Rift display defaulted to “Portrait” labelled mode, even though the thumbnail picture showed it looked like landscape, and that was the correct orientation. The Nvidia Control Panel showed the Rift also as in Portrait mode, but there the thumbnail was 90 degrees rotated and looked like portrait. If the Rift display looks like its rotated 90 degrees to what you expect. Change things so its in the right orientation by one method or another. There is a recommendation to drive the Rift DK2 at 75Hz for the smoothest image. 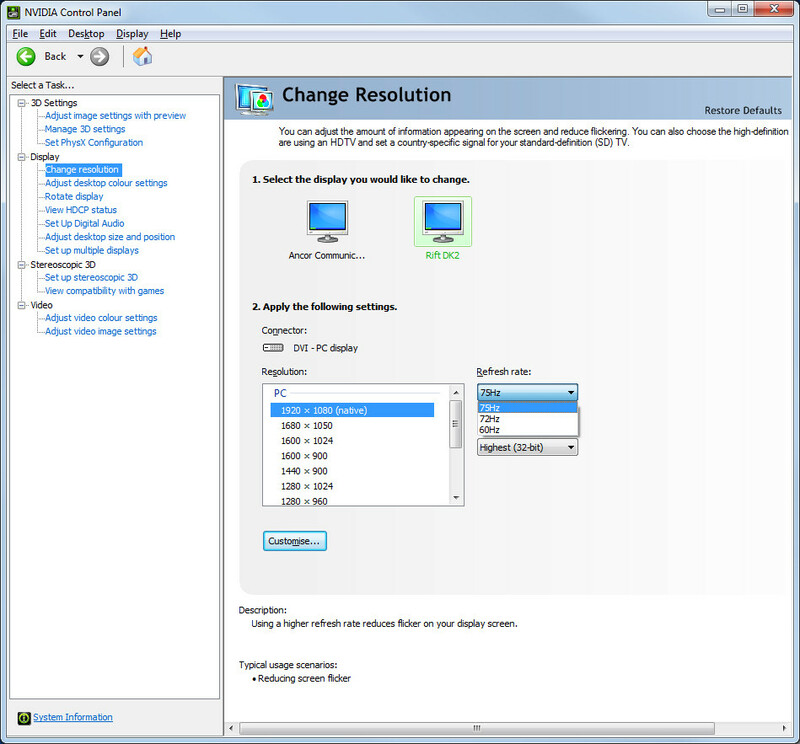 The Windows Screen Resolution “advanced settings” area did not give any refresh rate options for the Rift monitor slot – showing it as a generic pnp monitor. 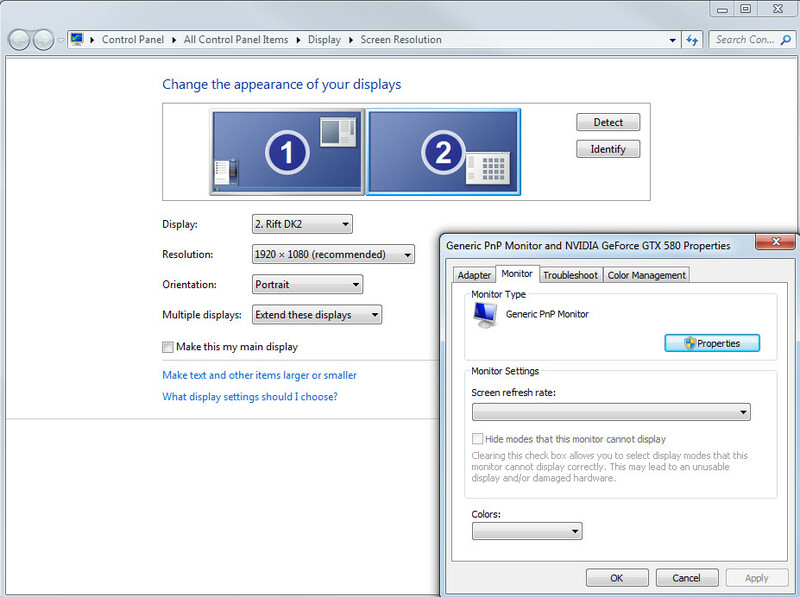 But the Nvidia Control Panel did show refresh rates of 75Hz (preselected), 72Hz and 60Hz. The CtrlAltStudio viewer can use the “Xbox 360 Controller for Windows” game pad (Wired or wireless) as an input device, which assists in controller the avatar movement and camera control without having to fumble to find keys on the keyboard. I did find though that the current default settings for the control of avatar and camera movement were a bit sensitive, and drift continued after the sticks were released. The zone of movement of the various axes gave inputs of -1.0 to +1.0 with a central released position should be 0.0. But the controls can stick a little off the zeroed position, and I found that mine could stick at about +/-0.2. 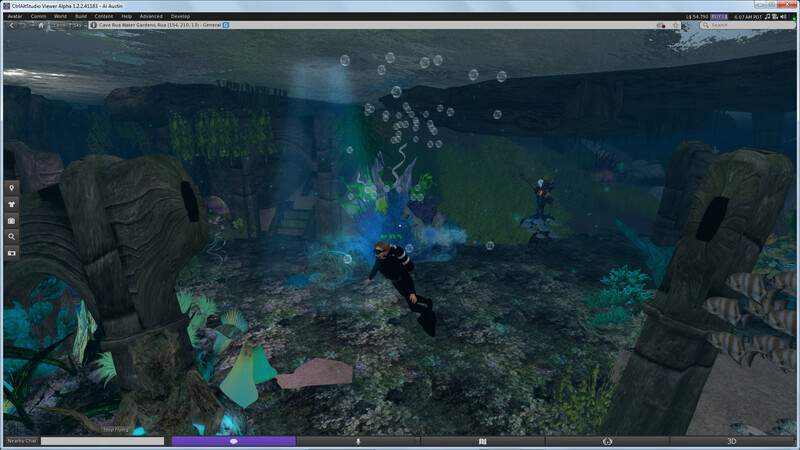 The “dead zone” adjustment to allow for this was set at 0.2, so sometimes the movement was continuing. Changing the deadzone to 0.25 fixed this, but 0.3 seems safer. 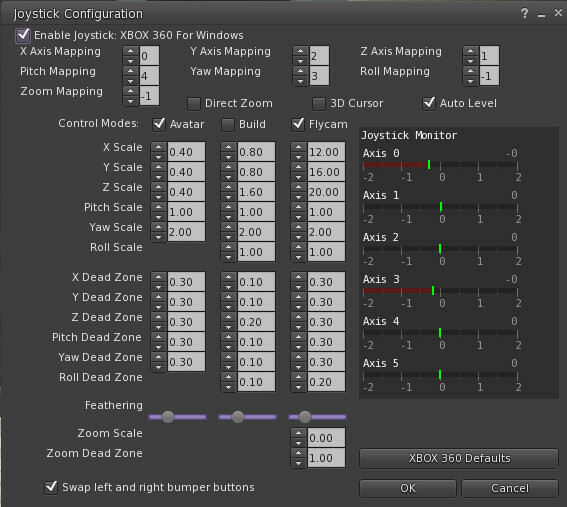 I also adjusted the sensitivity of the main X,Y and Z controls by adjusting the scale from the CtrlAltStudio provided values of 0.3 to 0.4. This means you have to move the sticks further before your avatar breaks into a run. As noted there, “feathering” is to make your controls feel mushy, or slow. When you start or stop moving the flycam/avatar there is a delay that can either give a nice dramatic slow camera movement (when slider is to the left), or a wobbly flicker of camera (slider towards the right). I left this on the defaults provided by CtrlAltStudio. 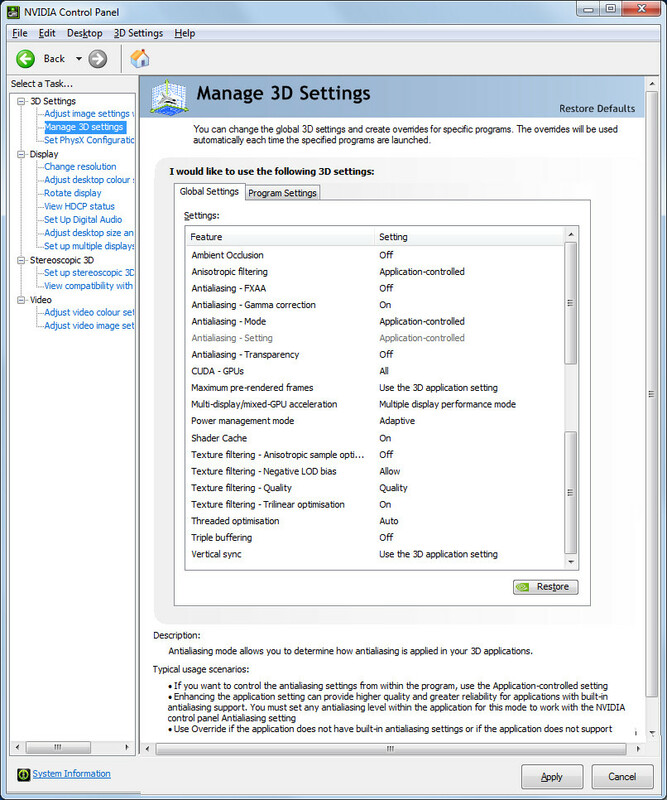 For Nvidia GPU users, 3D settings can sometimes also be changed via the Nvidia Control Panel “Manage 3D Settings” tab which allows for program-specific overrides of some features.. including refresh rates in some setups… though not for my Nvidia GTX 580 or 690 GPUs. This entry was posted in Oculus, OpenSim, Second Life, Virtual World, VR and tagged CtrlAltStudio, DK2, Oculus Rift, OpenSim, Second Life, Virtual World, VR, X-Box. Bookmark the permalink. Can SL run at stable 75 fps 1080p 3d sbs? Yes Alberto, on suitable recent equipment with a decent GPU… Even on GTX580 I can see 100 to 120fps even with ultra graphics. Depending on the content of the region and view distance, even with 256m its possible. But turning shadows on does tend to half that. So on my moderate rigs I turn shadows off for Rift DK2 use. I have a msi laptop, amd a10-5750M and radeon hd 7970M but i can barely get more than 30 fps o most occasions, only on skyboxes i can get near 100fps, i think i should just buy a good desktop computer. 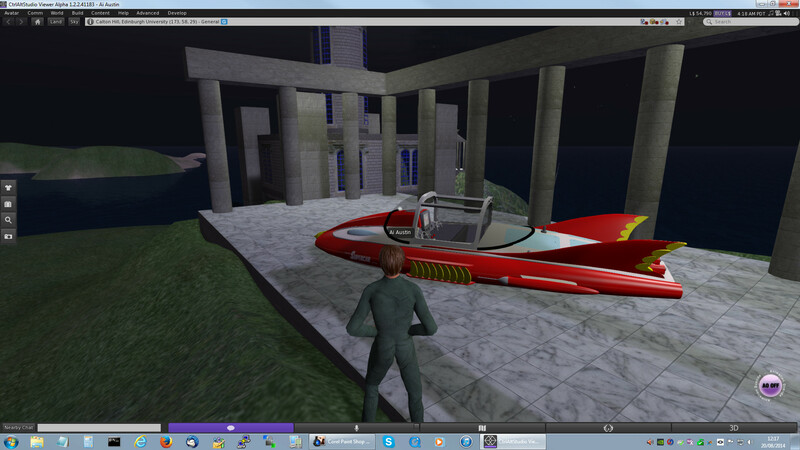 I just did a test on my i7-2600 3.4GHx, 8GB memory, Nvidia GTX580 rig… (not the very latest but not bad in other words) and with shadow off and 128m view distance on a quite built up area on Virtual University of Edinburgh (Vue) region in Second Life. I was getting 75 to 100fps with a full 1920×1080 full screen on CtrlAltStudio (i.e. ready to switch into Rift). 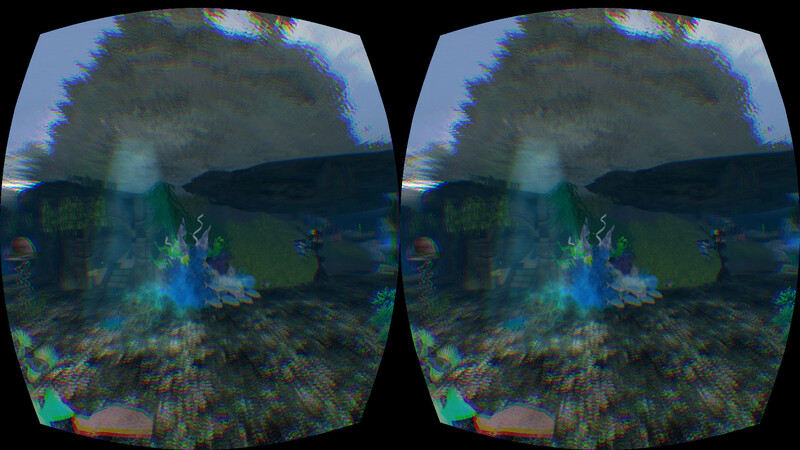 Turning shadows looks better, but it can half the fps, but its still usable on the Rift DK2. On busy regions with 30+ avatars, the frame rate was lower at 30-50fps. 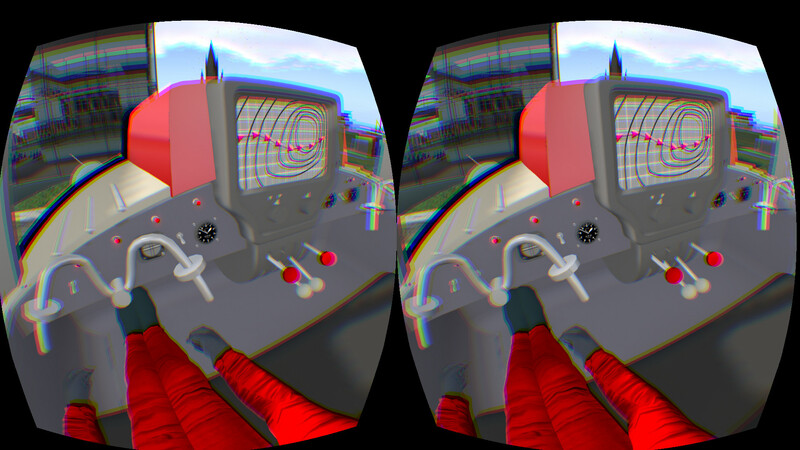 If the GUI buttons could be brought up and dismissed by a single key/controller button (one easily found as you are blind with the Rift strapped to your face) and shown as an overlay like a Head Up Display in the medium distance… then use the headset positional tracking itself to focus on the buttons, highlighting each as you pass over then. Then allow one easily found key/controller button to select or toggle the button. That’s how the Titans of Space spacecraft controls, navigation system and even peripheral settings buttons work… and it was the only one I have used that felt natural and did not break the immersion, or require memory and touch feeling skills to locate a key on an invisible keyboard.